This crust boasts the nutty goodness and nutritional punch of quinoa—with no processed flour and no gluten! Use the filling below or easily substitute a personal favorite. Give yourself at least a couple of hours, because in a few spots you have to wait for things to cool before you can proceed. Cook the quinoa (this can be done ahead of time): Bring the quinoa and water to a boil, stir well, then cover and reduce to a simmer. Simmer for about 10 minutes or until all the water is absorbed. Remove from heat, fluff with a fork, and re-cover. Let cool. Preheat oven to 375°. Prepare a 9” pie pan with cooking spray. Make the crust: Combine the cooked quinoa, flaxmeal, egg yolks, salt, and pepper in a large bowl. Use your hands and knead the mixture until it holds together. Press the mixture into the pie pan, until it is about ½" thick on the bottom and sides, forming a little lip along the top. * Bake the empty crust for 20 minutes, then take out of the oven and let cool. For the filling: Sauté the onion and red pepper in olive oil until softened (about 5 minutes.) Add the spinach and cover. Stir occasionally until just wilted (another 5 minutes or so.) Remove from heat. Now combine the milk, eggs, egg whites, salt, and pepper in a bowl. Mix well. 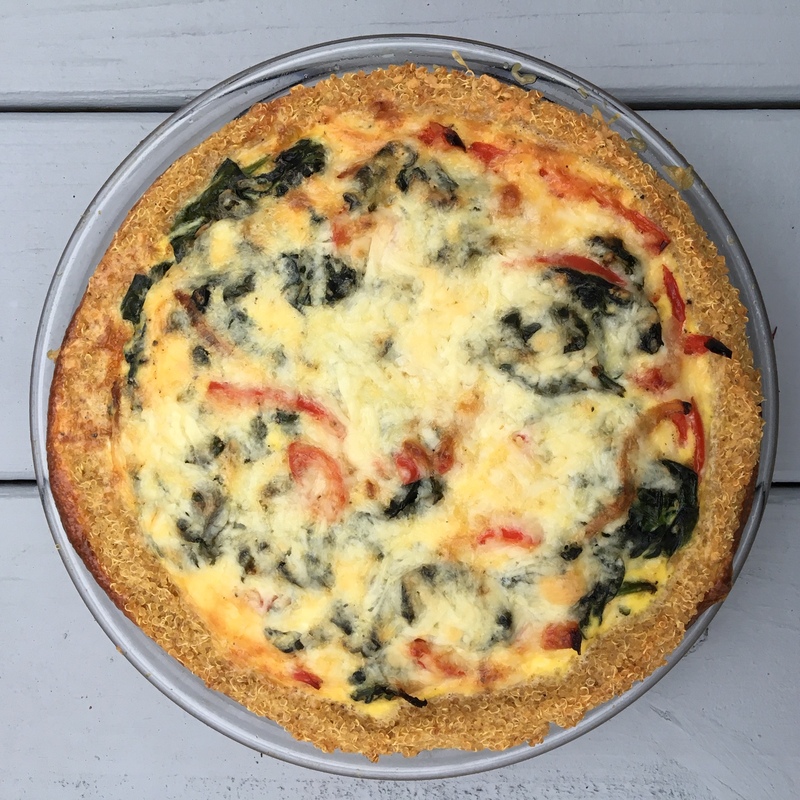 Spoon the spinach and pepper mixture into the bottom of the crust, and pour the egg mixture on top. (You may have a bit too much egg mixture, too. Don’t overfill!) Top with grated cheddar, and bake for 35 minutes. Let stand 5-10 minutes before serving. *You will probably have extra. Spray a small pan or baking sheet and make a little quinoa crust “pancake” to bake at the same time. It makes a great little snack!